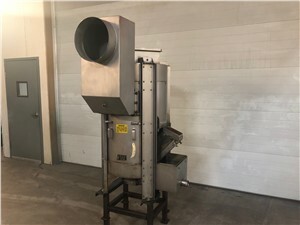 Spin Dryers for the plastics industry are used to separate pellets from the water slurry in a continuous operation, usually an underwater pelletizing operation. Sometimes called centrifugal dryers, the dryer has a spinning rotor that conveys the plastic pellets up the dryer while the water is discharged out the bottom. The drying process is used to reduce the moisture in the pellets. Typical manufacturers are Gala Industries and Carter Day. Centrifugal Dryers for the plastics industry are used to separate pellets from the water slurry in a continuous operation. Typically centrifugal dryers are used in an underwater pelletizing operation, after a sink float tank, or in plastic washlines. You might here these commonly call “spin dryers”, or “spin away dryers” because that’s the main operation. The dryer has a spinning rotor that conveys the plastic pellets up the dryer while the speed of the rotor causes water to be separated. It passes through screens that the pellets cannot. The excess water is discharged out the bottom. The drying process is used to reduce the moisture in the pellets. Some of the most popular manufacturers of these machines are Gala Industries and Carter Day. When buying a Centrifugal Dryer there are a few specifications to consider. Drying Capacity of these dryers can range from 1,000 lbs-50,000 lbs/hr +. Since the capacity’s are listed an weight per hour it is important to know your specific process. Pellet size and shape can greatly impact the amount of weight that can be processed. Spin Dryers can be purchased with many different options. Some important options to note is the metal used. Most spin dryers are Stainless steel, but higher grades and abrasive resistant materials are available. Another highly sought after option is in inline De-Watering unit. This is used before the spin dryer to remove most of the surface water before it has to enter the machine. Agglomerate catchers are also used to catch larger pellets or “clumps” before the enter the dryer. PRO TIP -When buying a used centrifugal dryer, it is good practice to inspect the condition of the rotor lifters. This tends to be the area of the machine that commonly wears out first. Contact an Arlington Machinery salesperson if you have an interest or general questions about spin dryers.